Students from low-income high schools have the odds stacked against them. Many are first generation Americans whose families are scraping to get by -- and international travel isn't even a consideration. Afar, a media and travel company, is working to change that. 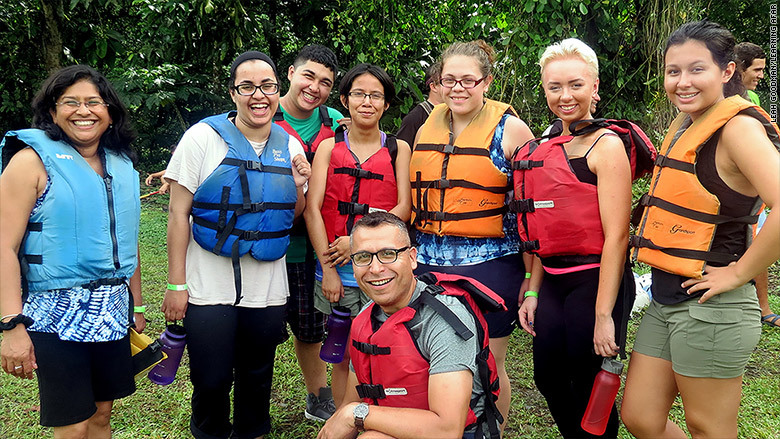 Its program Learning Afar, which launched in 2009, sends high school students from underserved communities abroad to learn about things like sustainability and community-building. Afar cofounder Joe Diaz said the core belief behind the program is that travel is the best form of education. The program started when 20 students, 10 from Yonkers, New York, and 10 from Oakland, California, traveled to Costa Rica. Since then, it has sent 613 students and 79 educators to six countries. 63% of the students are first generation Americans and 93% are on free or reduced lunch programs. Diaz believes that giving students the opportunity to "travel in a deeper way" will ultimately improve the country. The trips last between eight and 15 days, depending on the destination and the funding, which comes from Afar and by corporate and individual donations. The company begins by identifying a school in a low income area. Students apply and are chosen based on a factors like merit, need, passion and diversity. Diaz says that they're not looking for straight-A students, but, rather, applicants that express the desire to participate and a strong interest in the world around them. One of the program's goals is that students will form bonds that continue when they return to their schools -- creating a ripple effect throughout the student body. Diaz said this happened with a group of Chicago students who traveled to Costa Rica and learned about the problems associated with littering. When they returned, they created a school-wide campaign focused on tackling waste. And the program's benefits extend beyond just high school. Diaz said 100% of Learning Afar participants have graduated from high school, which is remarkable considering that graduation rates in their schools are closer to 50%. Deisy Cedeno, a 19-year-old studying art history and economics at Barnard College, participated as a high school student in New York City. She and 13 other students went to the Peruvian Amazon, where they worked to develop a library and raised money for the books. It was Cedeno's first time out of the country, and working with her peers to build the library made her realize how much she loves serving a community. She said the trip made her realize that she didn't want to go to a community college and encouraged her to apply to 30 schools. "It made me more outgoing. It boosted my self esteem," she said, adding that she's still in touch with her mentor and the students she traveled with. "My goal is to send a million students on these trips," Diaz said.